Masks are one of my favorite expressions of human creativity. As an undergrad theater student I had the chance to work closely with masks. It was a project that students tended to either love, or hate, and I loved it. Each student was assigned a mask to work with, for a 2-3 week period, during which we had to really bond with the mask. We also had some hard rules for dealing with the mask one on one. The most important rule was to never do anything to a mask that you would not do to your own face. We were also warned specifically not to stick anything in the eyes, or other holes in the mask's face. Again...would you do that to yourself? Because of these rules, it was made clear that we were to respect the mask as an individual. And individuals have their own wishes and whims and personalities. Masks offer a chance for transformation that is difficult to find in other, non-chemical ways. When you think of the ways, in our culture, that we use masks, that becomes very apparent. Halloween is one example...wild kids of all sizes enjoy the freedom of obscuring their own faces behind that of a character. Robbers erase their identity in order to achieve their goals. A masquerade party seems a little extra magical because nobody is what they seem. And indigenous cultures all over the world have used masks to express values, and connect with the spirit world, invoking spirits (and all that can mean) by wearing their faces. When we used the masks in class, we began to see our classmates behave and sometimes speak in ways that we never saw them reveal in other contexts. And we felt our own bodies compelled to move in ways the masks "told" us to move. At the American Museum of Natural History recently, in NYC, one of my favorite exhibits was the Northwest Coast Indians exhibit. I couldn't help but wonder how such artifacts same to rest in a museum, rather than in the hands of the people that created them. 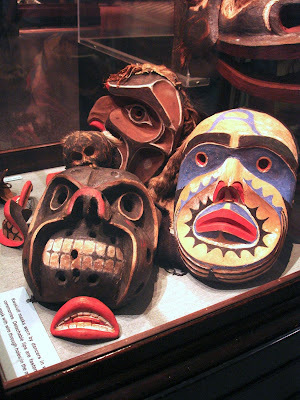 But regardless, it was a treat to see them, and in particular the masks of each of the coastal cultures featured. I grew up in the Pacific Northwest so it was also beautiful reminder of home, and of images that are very familiar if you are from that place. The masks featured served a variety of purposes. And each one was crafted by human hands. It was moving to see them far outlive the hands that made them...and to see that even now, over a hundred years after they were created, they are still happy, and scary, and funny, and terrifying, and full of personality.